I have been having issues with my printer when I use 0.25 mm nozzles. The PLA leaks like crazy between the nozzle and the heating bloc. I changed the whole hot end including the nozzle. I tried to tighten the nozzle more, but I went to the point where I twisted a hot end and it never solved the issue. My hypothesis is that I am trying to push PLA to fast for the 0.25mm nozzle hole, so it starts to leak where it can. Any input on this? Any tip to make make the nozzle leak proof on the barrel? 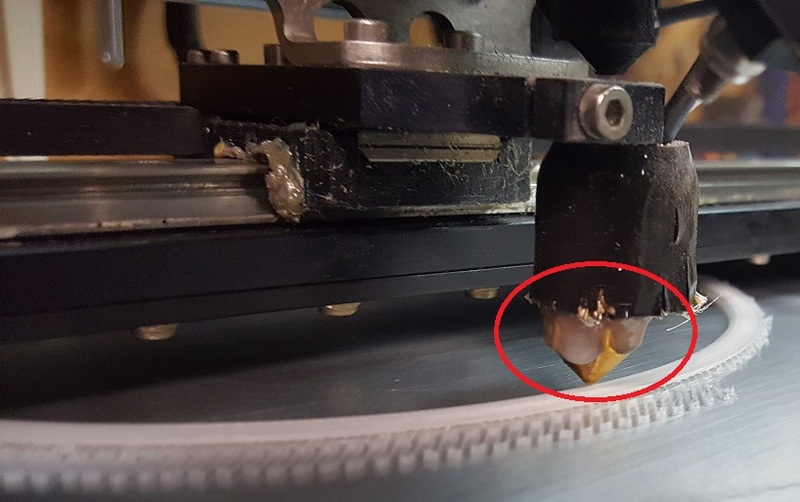 I have only had this problem once and that was when I tried to tighten a nozzle when it had been used (had plastic in it) and the hot end and nozzle was cold. In doing this I cracked the nozzle causing it to leak. I use a .25 nozzle often, and never print faster than 40mmS with it, but don't think it would leak no matter how fast you print.. filament may strip out but if the nozzle was on tight when new there should be no leaking. Switching nozzles is a pain, I have since bought 2 more hot ends so I have one for .25 .35 and .5.. change the entire hot end rather than the nozzle. Yeah I think you're right I probably should use the spare hot ends I have and stop swapping the nozzles. I would need three also: 0.25, 0.35 and Hardened Steel. I still do not understand what is happening with my current nozzle though. The hot end was basically brand new. I did a couple of prints with a steel nozzle. Then I heated the hot end, removed the steel nozzle, cleaned the barrel, installed the brand new 0.25mm brass nozzle. And boom, that issue still is there. If you are having the same issue on with the same nozzle on 2 hot ends, then you probably have a bad nozzle.. remove and inspect with loop or US microscope..
Nah... the nozzle was brand new. Like shiny out of the bag. Had the issue with two different hot ends and two different nozzles. The issue must be with the way I clean and assemble the thing. I had this same problem. I broke 3 hotends before doing this. Look i know everyone says change it hot. And im just saying what happened for me. Every time i changes them hot it leeked and the last time changed it cold it did not leek. Also i think makergear has a video of them doing it cold. i agree try not to change it have a few extra for diffrent sizes. Yeah makes sense. Now that I think about it, I never had the problem couple of years ago when I did not do the "right" thing and changed the nozzles cold. I think I will try back my old habbit.